This is a tasty, original and generous collection of works for horn and orchestra. All credit to the Australian Government for having the percipience to fund it. 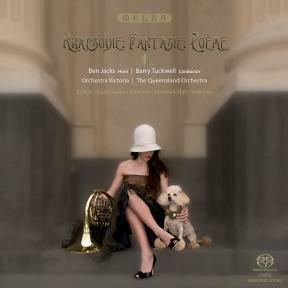 It's very much a Franco-Australian affair with the Damase Rhapsodie commissioned by Barry Humphries and the last piece being the Phantasy by G.W.L Marshall-Hall. The latter was born in London but was resident in Melbourne from 1891 until his death. The horn player, orchestras and conductor are Australian. Melba is an Australian label of fragrant distinction and the musicians are all Australian by birth or firm adoptive choice. The Damase Concerto was premiered at an international symposium of horn-players in Bordeaux – the composer’s birthplace - in 1995. Jacks ' tone here and throughout is steady, bold and true centre. This is so even when he plays the more languid role of singer-enchanter as in the third movement. The final allegro vivace has a gritty pulse over what is a constant presence: a strong sense of Poulencian melody and poetry. Even so the progress of this delectable music is hardly ever becalmed. Don't miss the many soloistic touches from the orchestra. There’s a dialogue with the first horn and singing tendrils of the sweetest melody from the Leader. It's a lovely work and you need to add it to your heritage tracks. We have heard the three movement Koechlin Poème before. This work majors on the pensive-pastoral rather than the active. However the finale provides some bushy-tailed dynamic contrast. Even so this readily melts into the warmth of summery woodland glades perhaps in the manner of Bax's Spring Fire. The single movement Damase Rhapsodie was written for Tuckwell who premiered the work in 1986 in London. Here Tuckwell defers to the young Ben Jacks and takes to the podium in full and generous empathy with his soloist. This sea-inspired work is full of intriguing twists and turns. There is nothing here of dissonance - just tonal succulence and pleasing rhythmic invention. It passes through many gradations of mood. A boulevardier insouciance sometimes comes to the fore. I am not sure I would have detected anything oceanic if I hadn’t been told. That said, there is a wave-lapping cradling to the final peace-suffused pages. Very satisfying. We need to hear much more orchestral Damase and urgently. The Dukas Villanelle is as arranged by Paul Terracini who has a light hand in these matters. Dukas's famously unforgiving self-critical judgement resulted in his own orchestral arrangement being destroyed. It is good that Terracini has given this piece new orchestral wings with an eye to the bubbling Rimskian flavours of the original. The Saint-Saëns Morceau is not exactly unknown though hardly common either. It is at times rather like a Mozartean take on Brahms. A delightful light piece. Marshall Hall's Phantasy was written when the composer had only ten more years to live. It's a late-classical romantic ‘conzertstück’ with a Tchaikovskian swoon mixed in with Weberian liveliness. The closest thing to hot cakes in years. Snap it up now.